Have to admit I am drooling a little just from reading Cookies and Cups’ recipe which is based on a Ben & Jerry’s ice cream flavor, Karamel Sutra. Where was this ice cream flavor? How did I miss it? IS IT COMING BACK? 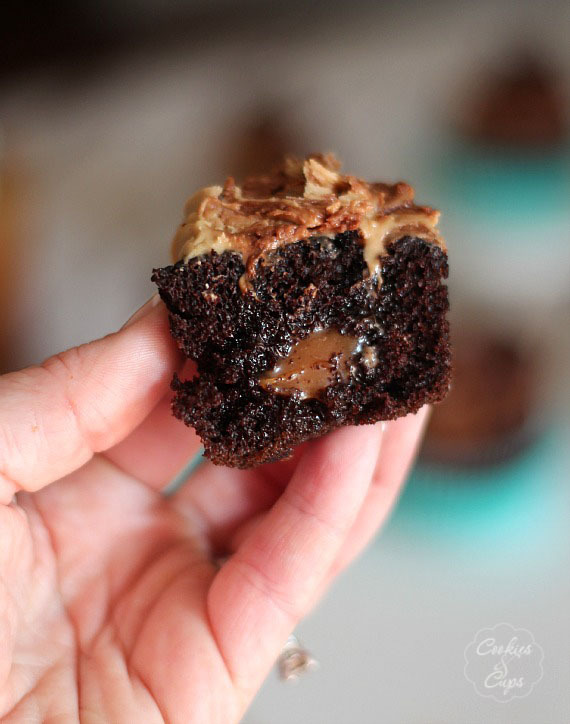 Ok, ok….back to the cupcakes which consist of a rich, dark chocolate cake filled with homemade caramel sauce and topped with chocolate and caramel frosting. I suppose the cupcakes are better because I don’t have to rely on Ben and Jerry making the flavor and shipping it to a grocery store where I live. Spoken like a true Cupcake Fanatic. Melt butter in heavy saucepan over medium low. Add sugar and corn syrup and cook 6-8 minutes until mixture is a deep caramel color, stirring constantly. Add cream slowly while stirring and cook 2 minutes more until smooth. Remove from heat and allow to cool completely (about 2 hours). In a large saucepan melt butter and chocolate chips together until smooth. Allow to cool completely. (I let mine sit in the fridge overnight) It will become solid. With hand mixer beat the solid chocolate until it becomes light and fluffy. In medium saucepan melt butter and sugar together. Bring to a boil and then add milk, stirring until smooth. Allow mixture to come back to a rolling boil and boil for 2 minutes. Remove from heat and allow to cool. When caramel is cool beat in powdered sugar and vanilla. 2. Fill a piping bag with frosting fitted with a large tip. 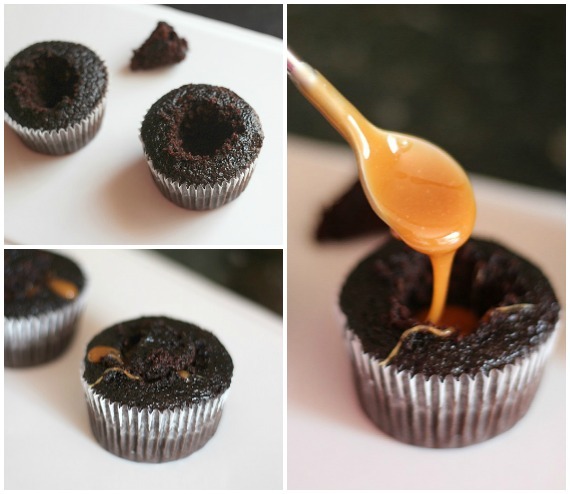 Spread caramel frosting on one side of the bag and chocolate on the other, so when you frost the cupcakes, the frostings will swirl together.